The lighted display is large and easy to read. There are no mistakes when the temperature compensating microchip quickly senses the electro conductivity of the nutrient solution or water sample and automatically freezes the displayed reading. 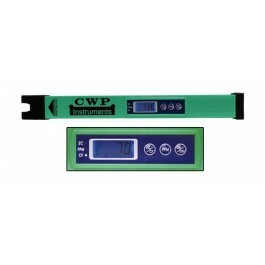 PPM, EC and CF scales are easily accessed by easy to read buttons. Cutting edge electronic circuitry keeps the meter in calibration for extended periods of time. The TDS Wand is waterproof from the electrode up to the display, water resistant from the display to the battery cap. Uses a common 9-volt alkaline battery for power. Use 1382 ppm (500 ppm – 1 EC) calibration buffer. 1 year limited warranty.